This book was such a great concept! I don't think I've read anything like it before. We've all read books about a girl needing to achieve some goal to get the crown and become Queen of a probably-riddled-with-monsters world, but a story in which there are already 3 queens who need to battle to the death to win the crown? Colour me intrigued. The concept of the death-by-sister is something along the lines of: the girls train separately, living apart; there's Beltane, which marks the beginning of an Ascension year; and the Quickening, a time in which the sisters show the island what they're all capable of. When Beltane ends, and the Ascension year begins, the sisters have 1 year to rid the island of the other 2 sisters and become Queen. Each chapter in this book alternates between the three sisters, Mirabella, Katharine and Arsinoe (in case you have to Google how to pronounce this name like I did, here's a handy YouTube voice clip). Each of the girls have their own community around them, helping them out, supporting them, training them up in their individual magical abilities. Katharine's story begins the book, and we quickly learn that it has been a Poisoner Queen for hundreds of years now, and that they are the strongest group on the island. But Katharine and a select few know a secret: Katharine is not immune to poison like the rest of them. Each day she trains, ingesting poisons to help build a resistance, but every time she is ill and can't handle it. Arsinoe is a naturalist, and while she trains with her best friend, Jules, and the people around her, she's not a very good naturalist at all. Arsinoe is still awaiting her familiar, an animal which naturalists connect with, share their power with and essentially become one with. Jules is said to be the strongest naturalist in years, her familiar being a big cat, but Arsinoe has nothing. Mirabella is the sister believed to win the crown, as she's the only one who has any obvious power. Where the other 2 are weak and seemingly powerless, Mirabella is strong. She has a few friends close to her, her even help her escape her city at one point. They're the kind of friends one needs in a situation like this - will do anything for you. As the story goes, we follow each of the girls as they struggle with their powers (or lack thereof), we follow the suitors who are presented to the girls, we overlap occasionally in the first half, but usually stick to each character individually. This was such a interesting concept and I really liked the idea. There are a few reasons I haven't give it more than 4 stars. At the beginning, it didn't really draw me in. It was sort of jarring to leap from one character to the next right at the beginning of the story, which once we started knowing more about the characters, it became a lot easier. I didn't like how sudden a certain sister jumped into bed with one of the characters - you literally met him like 5 minutes ago! - and thought that whole line of the story was super odd. The ending wasn't as 'OHMYGOSH' for me as it seems to have been for others (reading other people's Goodreads reviews), as I figured something wasn't quite right from about the half way point. However, I did really enjoy the ending, and it was a great hook for the next book. While it wasn't a 5 stars from me, I will definitely be checking out the next in this series, One Dark Throne, which isn't set to release until later this year. 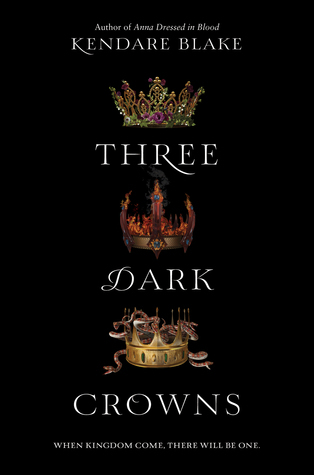 If you're after a fantasy-YA book which isn't like anything you've read before, definitely go and find a copy of Three Dark Crowns.